Rules for the liturgical colors went through small differences when Pope John XXIII revised the Roman Missal in 1962. The three Sundays before Lent, Septuagesima, Sexagesima, and Quinquagesima. The Vigils of the Immaculate Conception, Christmas, Epiphany, and the Assumption. The Vigil of Easter and the Vigil of Pentecost, up to but not including the Mass. The Communion service on Good Friday. The rose vestment set is allowed on Good Friday and the Easter Vigil. Mass on All Souls' Day if celebrated while the Blessed Sacrament is exposed. Red is worn for the blessing of Palms and the Procession, but not for Mass, on Palm Sunday. At all Requiem Masses including All Souls' Day. At the Good Friday liturgy up to but not including the Communion service. At the Easter Vigil up to but not including the renewal of Baptismal promises. 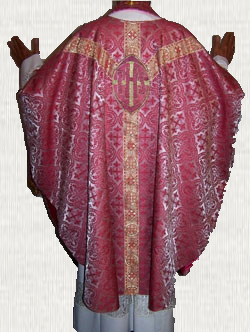 Vestment sets made from rose colored fabric are allowed on the two days indicated above, even where that color has not been customary. The main vestment colors are red, green, white, purple/violet and black, but other colors are permissible as well. Learn about the different vestment colors and their meanings by clicking here.